This fire escape is about one third of the way down the block. In the mornings, Mourning Doves, Starlings, and House Sparrows are wont to huddle here to catch the warming rays of the sun, sheltered from the predominately western wind. When this male American Kestrel appears, everybody else flees. I’ve spotted him up here twice now this month. 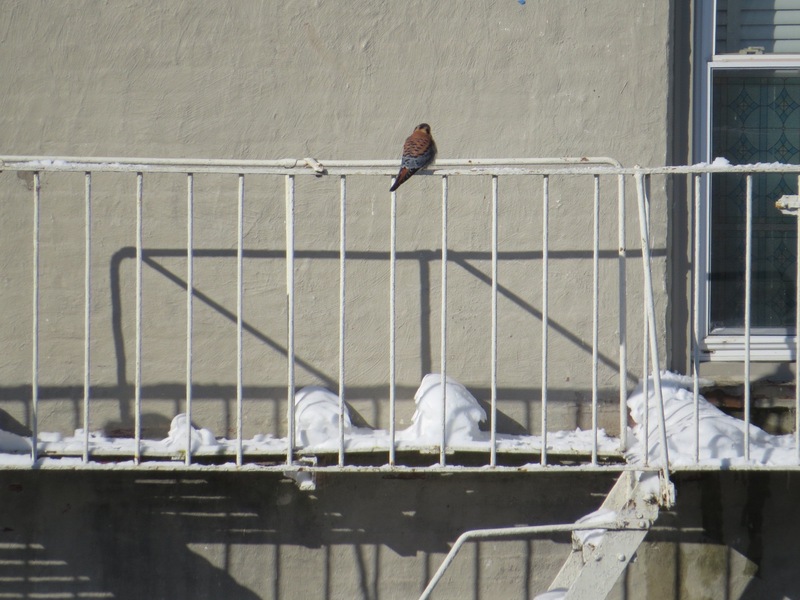 Another day, this time during the afternoon: a mature Cooper’s Hawk on the same fire escape. I have seen this one — and I think it’s the same bird — here three days in the last month. 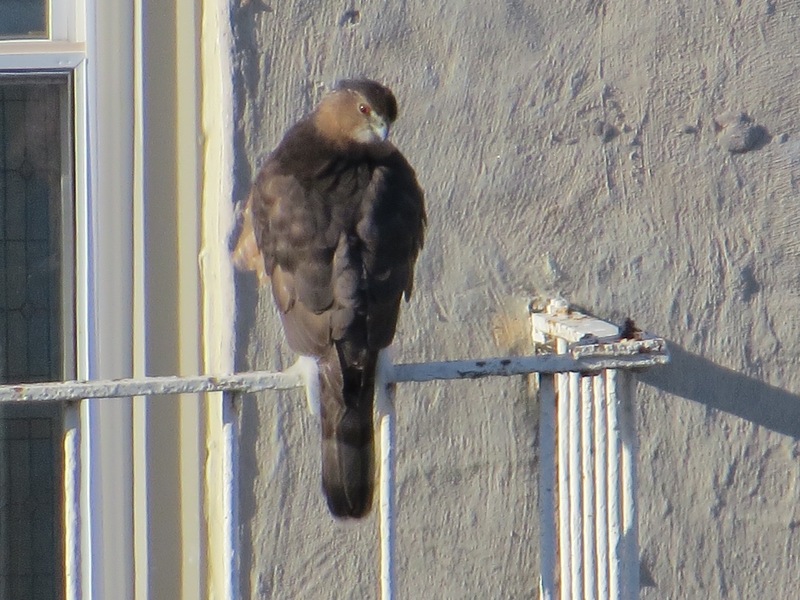 Last time he (and I think he might be male because he doesn’t look that big) was there twice in one morning; both times he flew towards our building, presumably veering to go through the alley. A definite raptor hot spot, visible from my desk. 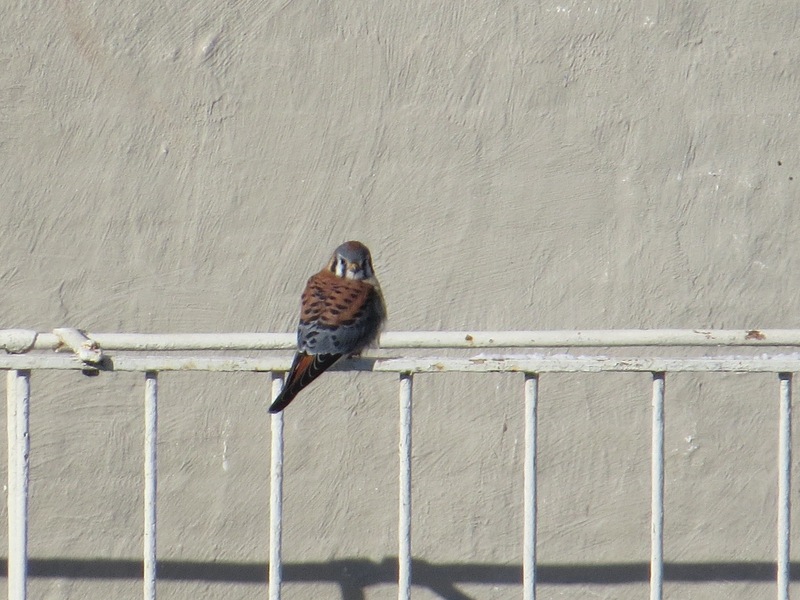 Unlike in previous years, I haven’t noted any Kestrels atop the large antenna at 40th Street & 5th Avenue this year. Last year at this time it was a regular perch. And St. Michael’s church, at 42nd Street and 4th Avenue, another raptor landmark last year, has only hosted one Peregrines so far this year. Raptor sightings in Brooklyn so far this year: 36. Saturday I had a record six, all individual birds: two Peregrines seen together; two adult Red-tails seen together; and male and female Kestrels separated by six blocks. All were within 3/4s mile of home.